Temple Square is a National Historic Landmark and religious center in Salt Lake City, Utah, and is owned by The Church of Jesus Christ of Latter-day Saints (LDS Church). Temple Square contains the Salt Lake Temple, Salt Lake Tabernacle, Salt Lake Assembly Hall, the Seagull Monument and two visitors' centers. With 3 million to 5 million visitors a year, Temple Square is the most popular tourist attraction in Utah. Layout of Temple Square, circa 1893. Old Bureau of Information building, which served visitors from 1904 to 1978 (1909 photo). The Assembly Hall at Temple Square at Christmas time. 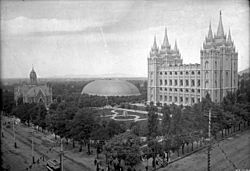 A panoramic view showing Temple Square from the Conference Center looking south. Temple Square Facts for Kids. Kiddle Encyclopedia.